Build a robot body and use our Zombiebot to save humanity. 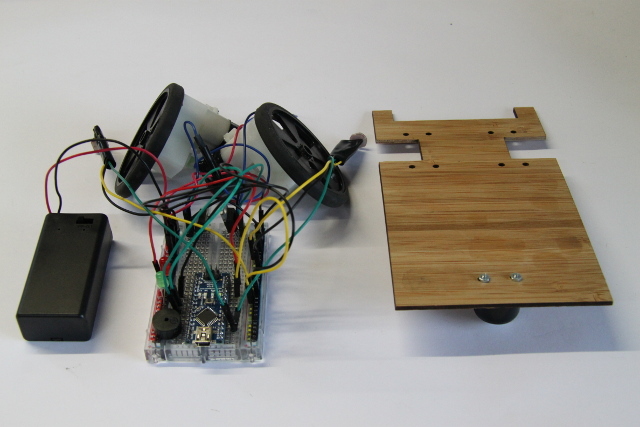 In the last challenge you built most of your robot: light sensors, 9v power & transistors, motor, gearbox & wheels. Now let’s build a body for your robot to sit on. For complete visual instructions, click here. 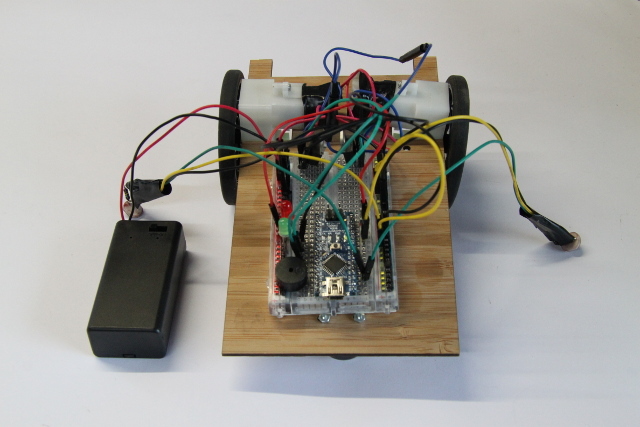 Turn the battery on and test your light sensors, motors, power etc. to make sure everything is working. Pop your bamboo chassis out of its surround, strip the paper off it, and set it up so the ball bearing is pointing down and at the rear. Use the rest of the blutac to stick the battery to the front of the chassis (Fig. 3). Attach your light sensors to the bumps on the front of the robot (up in front of the wheels), and set them up so that when you cover the left light sensor, the left motor goes forward (not the right motor) and vice versa. This means when the robot heads into a corner, the correct motor will turn on to steer it out into the light. If the right motor goes when you cover the left sensor, swap the light sensors over. Attach your light sensors to the bumps on the front of the robot (up by the wheels), and set them up so that when you cover the left light sensor, the left motor goes forward (not the right motor) and vice versa. This means when the robot heads into a corner, the correct motor will turn on to head it out into the light. If the right motor goes when you cover the left sensor, swap the light sensors over.